One Ride -Forever Ride -Merciless Ride -Eternal Ride -Innocent Ride -Simple Ride Heated Ride -Ride With Me (Hellions MC and Ravage MC Duel) -Originals Ride -Final Ride. 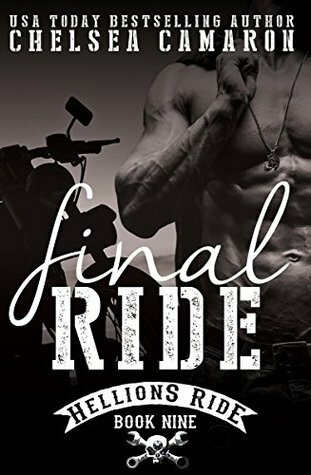 Final Ride is the last book in the Hellions Ride Series. I’ve read every single one in the series. I feel like I’ve been on a journey with Chelsea through this whole series. Although she put in the hard work, I only read her brilliant words. Going into this Final Ride was so sad, but really I feel it was time for it to end. As they say all good things come to an end. This was a great end to this series and I think anyone who has been on this journey with the series needs to give it a read. If you haven’t read any of the previous books from this series I feel that you will be completely lost. Even though it says on the blurb that it can be read as a standalone I really wouldn’t recommend it.